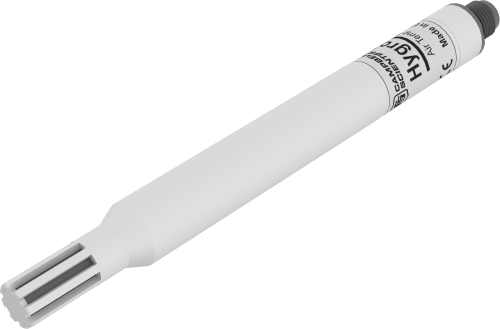 The HygroVUE™10 offers a combined temperature and relative humidity element in an advanced digital sensor that is ideal for weather networks. The electronics within the sensor provide accurate measurements, and the sensor is easy to use. The digital SDI-12 output allows a simple connection and measurement by many data logging systems. Another benefit is that this digital output avoids the extra errors associated with measuring analog sensors. A stainless-steel mesh filter on the HygroVUE™10 minimizes the effects of dust and dirt on the sensor while allowing air exchange around the sensor element and reducing the chances that condensation remains inside the filter cap. A small PTFE membrane filter is bonded to the surface of the element, which prevents any finer dust or mold from directly influencing the measurement. Because the sensor housing is designed to withstand permanent exposure to various weather conditions and to fit inside a range of radiation shields (including compact shields), the HygroVUE™10 is truly suitable for a wide range of monitoring applications. The HygroVUE™10 utilizes a latest-generation, Swiss-made, combined relative humidity and temperature element based on CMOSens® technology that offers good measurements, accuracy, and stability. Each element of the HygroVUE™10 is individually calibrated with the calibration corrections stored on the chip. You can easily change the sensor element in the field, which reduces your downtime and calibration costs. When you use the HygroVUE™10 outdoors, it is standard practice to install the sensor within a housing, known as a shield. The shield prevents solar radiation from heating the sensor and creating measurement errors. The radiation shield also provides a degree of protection from adverse weather, such as hail or driving rain. The most common type of shield is a relatively small, naturally ventilated screen that is low maintenance and requires no power. The HygroVUE™10 is specifically designed for field use with dimensions to suit common radiation shields. (Campbell Scientific recommends the RAD10E 10-Plate Solar Radiation Shield.) You can mount the RAD10E on vertical or horizontal poles. Calibration is easy to carry out by simply changing the sensor element. As each sensor element is individually calibrated, no further adjustments of the sensor are required. This means that when you change the element, it returns the sensor to the factory calibration state for both temperature and humidity—without interrupting your measurement collection for long periods. EMC Compliance Tested and conforms to IEC61326:2013. Sensor Protection Outer glass-filled polypropylene cap fitted with a stainless-steel mesh dust filter with nominal pore size of < 30 µm. The sensor element has a PTFE protective film with a filtration efficiency of > 99.99% for particles of 200 nm or larger size.